This information is to help you care for your drain when you go home. Remember to pick up and carry the drain with you at all times. Place it in a pillowcase or bag with handles. Make sure the drain tubing is secured to your clothes as your nurse showed you. You may shower with your drain. Pat the drain site dry with a towel after your shower. Do the following checks once a day at roughly the same time each day. Check that the suction is working – the picture labelled "suction" shows what it looks like when it's working. Put your drain bottle on a level surface. Mark the level of the fluid in your bottle on the white strip. Add the date and time when you did this. If you're concerned about the amount draining, contact the correct department or ward for your procedure. You'll find contact details at the bottom of this page. 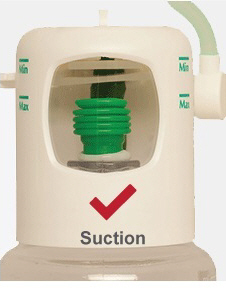 Check if your bottle is full and has lost suction. 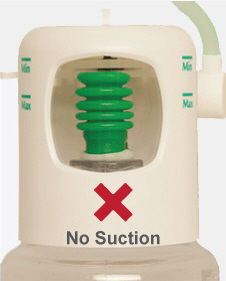 If it has, it will look like the picture labelled "no suction". Drains are held in place by stitches. If your drain falls out, cover the drain site with a dry dressing or clean cloth. Ask the operator to be put through to the ward you were in after surgery. Please speak with the nurse in charge for advice about any of your concerns. Ask the operator to be put through to the Ward 16 SARA co-ordinator. Written by HealthInfo clinical advisers. Endorsed by clinical director, General Surgery. Last reviewed April 2018. Australian Society of Plastic Surgeons. Breast reconstruction – a guide for patients. Edition 2. September 2009. Department of Plastic and Reconstructive Surgery, Addenbrooke's Hospital. Breast reconstruction. November 2008. General Surgery Service, Christchurch Hospital, Caring for your drain at home Issued July 2013. Authorised by surgical nursing director. Ref: 1268. Plastic Surgery Department, Christchurch Hospital. Breast reconstruction. Issued 28 November 2005. Authorised by Clinical Director, Plastic Surgery. Ref 0308. Simcock, Jeremy. DIEP breast reconstruction. Unpublished.